So What Are Adventure Pairings? You’ve probably heard of cheese and wine pairings, food and beer pairings. Pairings are all about creating a combination of two different things that bring out the best traits in each other. They’re about putting diverse experiences together to create something worth slowing down for and savoring again and again. 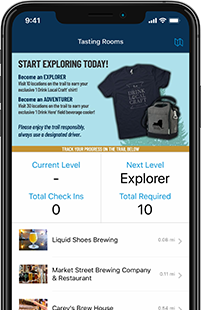 And with all the fun, exciting ways there are to take advantage of the remarkable landscape Mother Nature gave us (thank you, glaciers from millennia ago) it was a no-brainer to pair our exceptional craft beverage producers with exciting outdoor adventures. Explore the heart of the region on wilderness footpaths maintained by a large corp of volunteers. Stretching over 950 miles, this just might be one of the longest hiking trails you never even knew was there. That’s the beauty of the trail, though, providing mostly secluded hikes with an extensive trail system that includes six branch trails and twenty-nine spur and loop trails. If that’s not enough, the FLT connects with the Great Eastern Trail (which extends all the way to the Alabama-Florida border) and with the North Country National Scenic Trail (which runs from South Dakota to eastern New York). 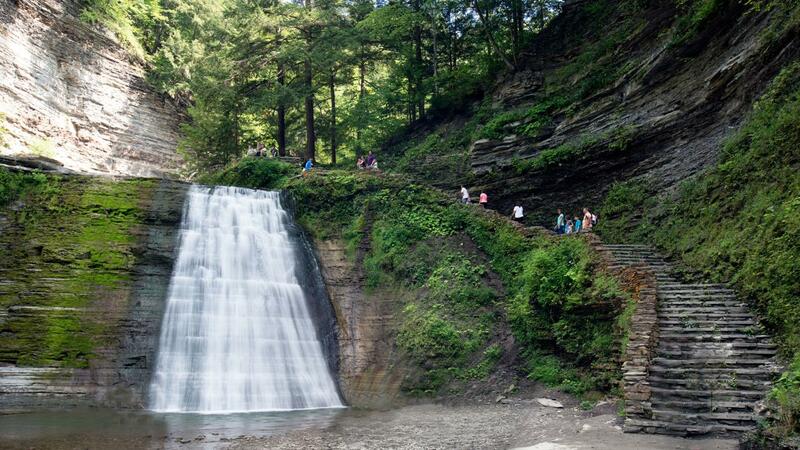 Whether you’re seeking multi-day treks, day hikes, or merely want to enjoy a walk in the woods for an hour or two, the Finger Lakes Trail is waiting. A number of the trail’s segments are located near craft beverage producers so you can enjoy a fun hike, then taste some delicious beverages. There are a number of state parks in the region, like Pinnacle State Park which offers hiking trails, picnic and camping options, as well as a scenic nine-hole golf course. Stony Brook State Park is one of those best kept secrets. While Watkins Glen and Letchworth get all the publicity, Stony Brook maintains a lower profile much to the delight of those who know it’s there. With three beautiful waterfalls, a stream-fed natural pool for swimming, three hiking trails (each is about a mile in length), numerous picnic areas, a playground, and over 80 campsites, you can spend a couple days exploring the wonders of nature, and partaking of some exceptional libations nearby. Watkins Glen State Park—named #2 attraction in all of New York State in 2017, and in 2015 was named the #3 state park in the country—is not to be missed. It’s not every day you get to walk beside and behind waterfalls and The Glen has 19 of them sure to leave you spellbound. While Keuka Lake State Park brings camping to one of the country’s most unique lakes. With lake access for swimming, boating, and all around splashable fun, this state park is very popular during summertime. *please note Stony Brook and Watkins Glen gorge trails are not wheelchair friendly, as there is uneven terrain and numerous stairs to navigate. Keuka Lake - There are a few reasons why, in 2017, Country Living named Hammondsport #10 of the “25 Best Small Lake Towns in America” and one of the biggest reasons is stunning Keuka Lake which has been drawing people to the region since the mid-1800s. Over 19 miles long and about two miles at it’s widest point, the warm, clear water makes for excellent swimming, fishing, and other experiences. Thanks to Keuka Watersports you don’t need to own your own equipment to get out on the lake and enjoy the beautiful setting. You can rent kayaks, paddle boards, jet skis, as well as deck boats and pontoon boats. Most mornings on Keuka you’ll find the calm waters ideal for paddle boarding and kayaking. If you’re an angler at heart, you can fish from shore, rent a boat, or even hire a guide as the lake is home to lake trout, brown trout, rainbow trout, smallmouth bass, landlocked salmon and other fish. 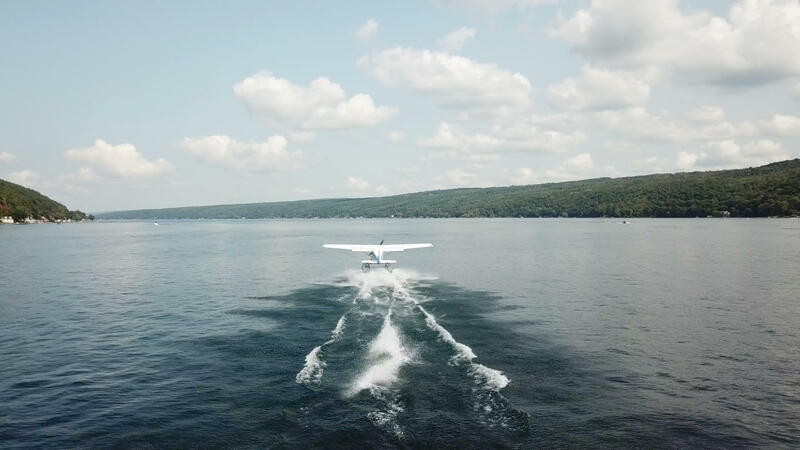 Finger Lakes Seaplanes - You might expect to find them in some remote part of the Alaskan wilderness, but there’s a long history of seaplanes and flying boats on Keuka Lake which can be traced all the way back to Hammondsport’s own, Glenn Curtiss, the “Father of Naval Aviation.” In homage to that rich aviation heritage and to the way Curtiss used Keuka Lake as a runway for seaplane flights and aviation innovations, two pilots have brought seaplanes back to the lake with Finger Lakes Seaplanes which offers rides off and over the breathtaking natural landmark. Keuka Outlet Trail - Another one of those secrets enjoyed by locals with wonderful hiking and waterfall experiences. Seven miles of wooded trail offers options for fishing, hiking, biking, horseback riding, as well as snowmobiling and cross-country skiing in the wintertime. The trail, which runs between Keuka Lake and Seneca Lake, is built on the old bed of Fall Brook Railroad, and follows the towpath of the historic Crooked Lake Canal which once connected the lakes. The descent is gradual, taking you through a deep gorge, and makes for hikes that aren’t too strenuous no matter which direction your headed. Seneca Lake - The largest and deepest of all the Finger Lakes (as well as the deepest lake located entirely in New York State and one of the deepest in the country), Seneca Lake is 38 miles from tip-to-tip. Known as the lake trout capital of the world, Seneca is home to numerous fish species making it haven for anglers rom around the world. You can enjoy guided fishing excursions on this popular lake, scenic sightseeing or dinner cruises, or a sunset sail on an historic schooner. Finger Lakes National Forest - New York State’s only National Forest provides a variety of unique and fun outdoor experiences. 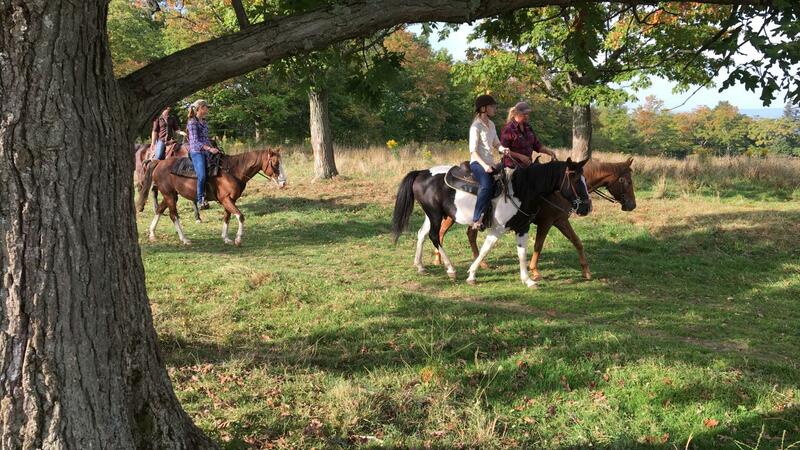 From horseback riding to hiking, camping, apple picking, and exploring, as well as historic sites from the Women’s Suffrage movement, the Finger Lakes National Forest has something for anyone looking for outdoor adventure. Chemung River - Gently winding it’s way through deep valleys, the Chemung River provides a sense of peacefulness you won’t find just anywhere. Follow the current downstream on a guided tour with Southern Tier Kayak Tours, stop on small islands to learn about the geology of the region and the history, take in the wonderful seclusion despite being close to all the action. Bald eagles, an abundance of wildlife, and gorgeous views round out the adventure. 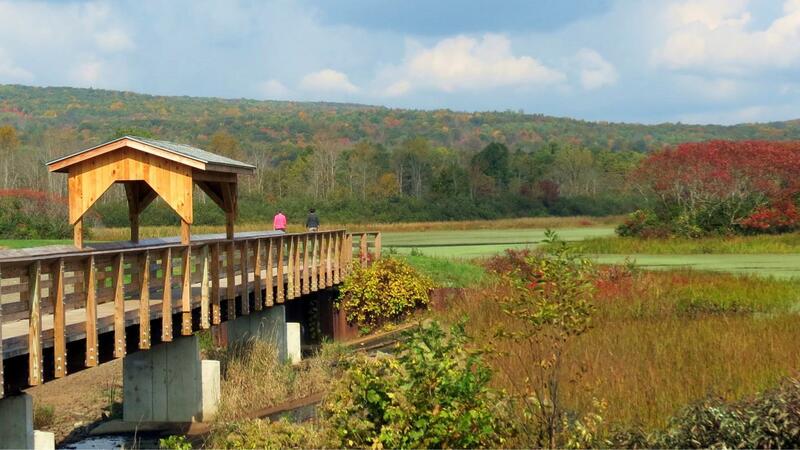 Spencer Crest Nature Center - A 250-acre community nature center, including over 7 miles of color-coded trails (including a section that wheelchair accessible), two ponds, and an environmentally-sensitive Museum of Natural Systems. Hidden on a wooded hilltop just minutes from downtown Corning, Spencer Crest is great for self-guided hikes, seasonal fishing, and cross-country skiing. Catharine Valley Trail - A recreation trail approximately six miles long that follows abandoned railroad tracks and towpaths of the former Chemung Canal. The trail is level, finished with crushed limestone, and wheelchair accessible. Popular for walking, running, biking, as well as cross-country skiing and snowshoeing. 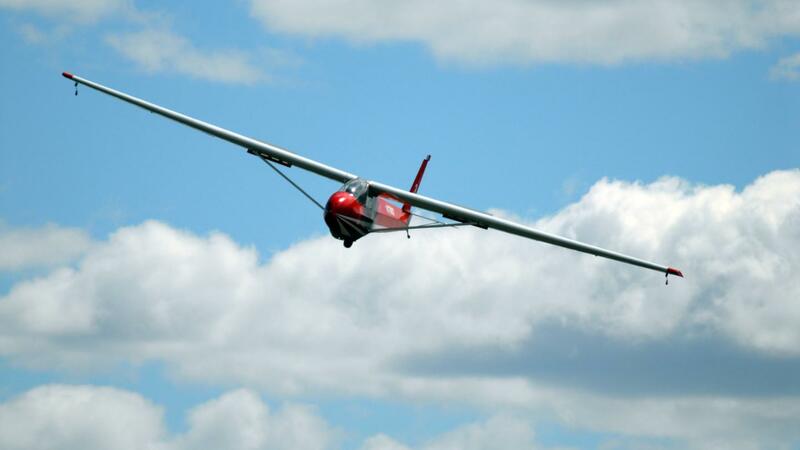 Harris Hill Soaring - Home to the National Soaring Museum where you’ll find the world’s largest sailplane collection, and the Harris Hill Soaring Corporation which offers seasonal sailplane and glider flights. Take in the region’s natural beauty from a truly unique perspective, as gliders are towed into the sky, then released to soar over the rolling hills and deep valleys below. Piloted by experts, you get to just sit back and take in the spectacular views. The serenity and sheer beauty of motionless flight is an experience you have to try to truly appreciate. Named the “Soaring Capital of America” in the early 20th century, Harris Hill has also been the site of several National Soaring competitions. The Harris Hill Amusement Park is a collection of small rides, mini-golf, driving range, swimming pool, picnic area, and other family-friendly activities. Tanglewood Nature Center - Named #1 on Best Things NY’s list of Best Nature Centers in NYS, Tanglewood is home to over 40 rehabilitated animals and a variety of interactive displays. The nature center is also home to an elaborate trail system, offering opportunities for hikers of all ability levels and some breathtaking views. Among the trails is the Mark Twain View Trail—a challenging hiking path marked with nature-themed quotes by the author along the way—and the popular Children’s Trail. Erwin Wildlife Management - This nearly 2,500-acre tract of land located approximately 5 miles west of Corning, features two man-made ponds stocked with bass, panfish, and bullhead, as well as trails for hiking and bird watching. Birdseye Hollow State Forest - Hiking and multi-use trails, including sections of the Finger Lakes Trail, camp sites, diverse wildlife including white-tailed deer, wild turkey, ruffed grouse, pheasant, woodcock, squirrel, cottontail rabbit, and waterfowl, plus multiple creeks and ponds for fishing, Birdseye Hollow is a great place toke in a beautiful sunrise and melodic early morning bird song. Waneta and Lamoka Lakes - These two smaller lakes—located between Keuka Lake and Seneca Lake—are close to each other and are great for fishing—largemouth bass, smallmouth bass, muskellunge, chain pickerel, yellow perch, bluegill, pumpkinseed, black crappie, rock bass, brown bullhead, golden shiner, white sucker, common carp. Prefer a relaxed paddle? Bring your kayak or canoe and enjoy some time on the water.